There are many articles available to help you create that perfect Middle-Earth bedroom, bathroom, or other living space … but what about your table? 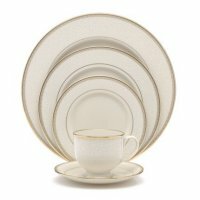 Have you ever considered that what dinnerware you use could make or break your Lord of the Rings look? If you’re curious where to begin, don’t wander off far. I’ve compiled a basic list of ideas you may use. 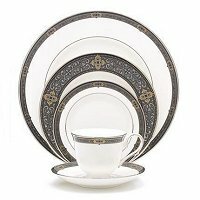 When looking for china, crystal or other table décor to go with a particular Middle-Earth style, I found it best to begin by breaking things down into three basic steps: define, categorize, and accent. At the end of this article I’ll lay out those three steps so that you can use them on your own. Let’s look at a few ideas of dinnerware styles that work with the most popular Middle-Earth races. Hobbits do not care for straight or oddly shaped items (like octagonal or fluted plates). Instead they prefer their items to be round. In the mugs and cups seen in the movie Fellowship of the Ring, hobbits are seen using pottery for their dining ware, so that is surely a safe bet for you to buy. 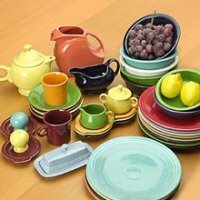 Since they love bright colors, especially greens, yellows and reds, for a festive hobbit table I would recommend Fiestaware; it seems right up a happy hobbit’s alley! I also think a hobbit living today would be interested in pieces that have flower and fruit designs. Johnson Brother’s Fruit Sampler, Botanical Garden by Portmeirion, Grape Vine by Ross-Simons, and Wild Strawberry by Wedgwood are along this line. Crystal on a hobbit’s table must be round – no questions there! 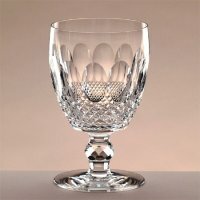 Colleen, a very popular pattern by Waterford, Colored Gems and Riedel from Lenox match this description. For everyday glassware, look around in specialty shops for pottery mugs and cups. 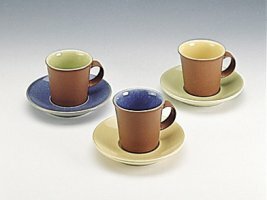 Denby has a line of everyday pottery-style dinnerware, including matching clay mugs. 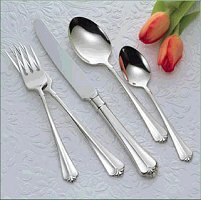 Silverware is harder to find, because most of the styles available at this time are flat and tapered rather than round. Finding the right set, although more difficult than finding elvish or human patterns, is possible as long as you stay in the basic parameters we set down earlier. Look for plain, rounded, homey styles. 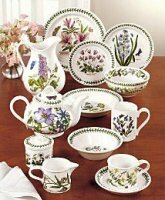 I recommend Lenox’s Verge, Oneida’s Obelus and Capello and two patterns from Reed & Barton: Alfresco and Dane. While setting the perfect hobbit-table, don’t forget the look of the furniture itself. Again, referring to the movie Fellowship of the Ring, notice that the tables and chairs used by the hobbits are rather reminiscent of a picnic table and Dutch-colonial inspired chairs. Personally, in keeping with Tolkien’s idea of hobbits loving round things, I’d use a round table. But as it’s your house, you decide which you prefer. Decorate your table with a bowl of fruit, some fresh flower or fall leaves (which can make cute napkin rings), cheerful table linens and you have a nice table any Hobbit would be happy to sit at. Elves. What a dramatic change from Hobbits. Rather than bright, cheery round pieces, your elvish dinnerware needs to cry out ‘grace!’. The elvish style has often been described as full of flowing, graceful lines, very symmetrical and natural in feel. Art Nuevo was often used by the artists and designers at Weta as a base for the elvish décor in the Lord of the Rings movies. 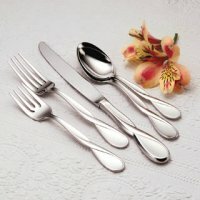 So a great choice when looking for the perfect elvish furniture, china, crystal and silverware, would be to find things in the art Nuevo style. 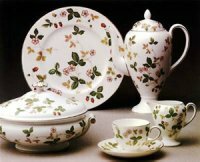 Claire de Lune by Haviland, Capital Gardens by Lenox, and Mystique from Royal Doulton are pieces that have rather lyrical designs on them. While Hobbits would not have cared for fluted items, it may just work in your modern Elvish look, so try something for everyday like Dansk’s Origami Talc or Mikasa’s French Countryside. If you want a back-to-nature feel, Waterford’s Brocade pattern works quite well. On an elvish table, the crystal provides a sparkle that would warm the heart of Elbereth. Elvish crystal is the easiest to find, because crystal is already such a sparking, graceful element on the dinner table…the trick is to find one with the least amount of straight (or purely round like Hobbit) lines. That’s why I really like Summer Breeze (Marquis), Soho (Miller Rogaska), Eclipse and Encore by Lenox, and Elberon, Kirin, and Merril from Waterford. 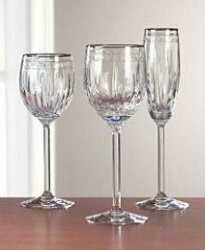 Look for pieces that have flowing lines, or perhaps a goblet that reminds you of a water-lily. The silverware on an elvish table should be made out of sterling silver and not silver plate. It’s got to sparkle like silver stars, catching every ray of light missed by your clear Elvish crystal. Flora, Melon Bud, and Grande Quintette, all made by Gorham, Othenia and Aquarius (Oneida), Golden Rhapsody (International), Atlantique (Ralph Lauren), Lismore (Waterford), and Alexandra and Ariana (Yamazaki), are just a few of the many pieces on the market. There is a lot available right now with lyrical feels and tapered ends – elf fans, better make the most of this! Of course you mustn’t forget the overall feel of the room here, either. For a rustic elvish look, go with chairs that have arms and backs made from branches and twigs. Long, sinewy legs and an ovular table-top are the perfect for your dining table. Heighten the effect with the proper accents: long, tapered candles in candelabras shaped like branches or twisted iron, vases full of delicate flowers or sinewy twigs with buds on the end (think oriental-style flower-arranging), or for the fall, autumn leaves scattered about. Strategically place mirrors around the room to make it feel more open. Essentially, the key is to blend the outdoors with the indoors. Are you more earthy and rustic with a love of the wilderness, or would you define yourself as a classicist? If you chose one of the first selections, you probably tend towards Rohirric-based designs. The second describes more of a Gondorian/Númenorian styling. A note on crystal. While definitely not featured in the halls of either Theoden of Rohan or Denethor of Gondor, your crystal can still fit in with the general look you are trying to create. Remember, we are working with the feel of a region’s décor adapted to the 21st century rather than duplication of movie styles. Some options that work for either cultures are Vintage Jewel (Lenox), Iona (Stewart Crystal), along with Ashling, Boyne, and Sheila (Waterford). Gondorian dining needs to be simply elegant. Pewter cups and dishes, if you can find them, would feel very Gondorian on your table. 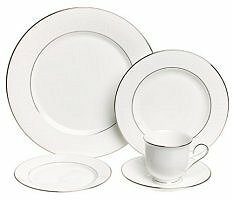 Casual china could be simple white or cream stoneware like Claridge from Mikasa and Lenox’s Butler’s Pantry. 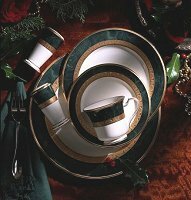 Tradition was a major part of Gondor’s culture so, whether formal or casual, your dinnerware should be classic. 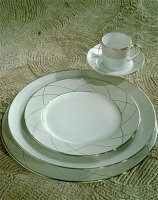 Ivory or white bone china with gold or platinum bands works perfectly, as do other pieces with more color or design. 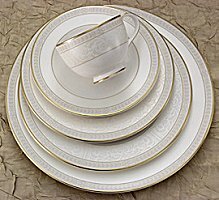 Hannah Platinum (Lenox), Saba (Rosenthal), Ashleigh and Gardenia (Royal Doulton), Florentine, Proposal, and Seville (Wedgwood), and Marqueterie (Versace) are just a taste of the variety of available pieces that are wonderfully in keeping with the Gondorian theme. It is interesting to note that Denethor in the movie Return of the King does not use any utensils. However, I believe it is more than likely that you would prefer to not use your fingers. If this is the case, read on. Otherwise, go ahead and skip this section. 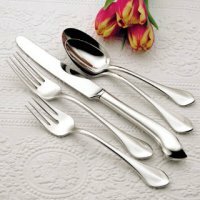 Once again, if you can get your hands on a set of real pewter silverware, that would be perfect. 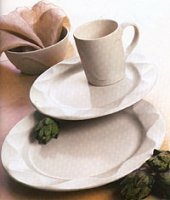 If you cannot find them, however, try patterns like these from Oneida: Juliard, Kenwood, and Sheraton, along with Forum by Reed & Barton. Keep in mind: classic is key! Your table—a sturdy, timeless design—could be set on a marble or stone tiled floor. Paint any columns and high ceilings black, and your walls white, cream, silver-gray or even (to completely modernize the look) yellow; you could even faux-finish them to imitate stone or marble. Add a vase of flowers, pewter or silver candlesticks, pitchers, platters and bowls and you’ve just created a beautiful Gondorian dinning room. The Rohirrim would have used wooden serving dishes and utensils. In the homes of the higher ranking citizens of Rohan the wooden bowls would probably be richly carved, painted, and perhaps even have gold inlaid in the band around the rim. The colors used should be deep, full and rich – blues, reds, greens and burgundies. The linens used should be made out of heavy fabrics. The furniture should be made from coarser grain woods. You could even faux-finish the walls to look like wood paneling, and stencil motifs in deep reds or gold’s on walls, table, chairs and painted stone floor. 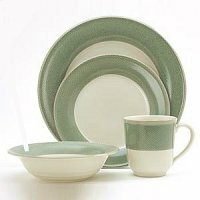 To get the full impact of your Rohan-inspired dining experience, you must again choose carefully when it comes to your dinnerware. Of course, in 21st century Rohan, styles would likely be different than in the movies. 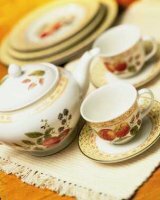 For fine china, go for grand, bold patterns in deep rich colors that have designs similar to those in the movies. 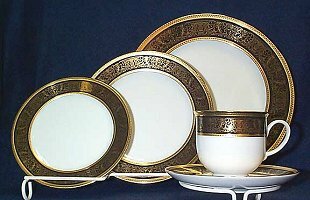 Fountain Bleau (Haviland), Vintage Jewel and Landmark (Lenox), Fitzgerald (Noritake), and Bokhara (Wedgwood). 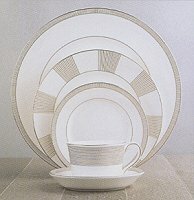 For casual, everyday settings look for patterns like Noritake’s Safari. Another good choice would be styles that are somewhat Scandinavian. 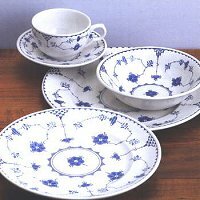 Blue or red and white dinnerware such as the Denmark patterns from Johnson Brothers offer this kind of folksy feel. 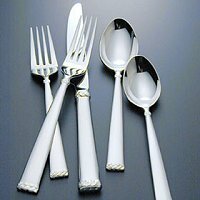 Your options for silverware include Antinea (Couzon), Valcourt (Gorham) Lenox’s Murray Hill, Waterford’s Celtic Braid, International Royal Danish, and Wallace’s Golden Grande Baroque. If you tend toward the Rohirric styles because you are a horse lover, Ralph Lauren offers a pattern called Equestrian Braid. Looking at the huge selection of styles on the market today can be a daunting task, especially if you are trying to ensure everything in your house blends into a certain Middle-Earth look. Certain pieces you see in stores may jump out at you, but you might be unsure whether or not they would really work. So it is important that you know what you are looking for and how to make it work. After all, it is one thing to look at a piece of crystal sitting on display and say ‘ok, so that is definitely elvish’, and quite another to know what makes it elvish. You’ve probably guessed by now where I’m going with this: the first basic step for getting the perfect look is defining it. Define your terms. Ask: what am I looking for? Why do I like (Rivendell, Meduseld, Bag End)? What basic shapes and colors are especially prominent in that style? Once you know what elements are essential for creating a certain aura, you are well on your way to success. Now that you can define what makes a style elvish, rohirric, etc., you’ll be able to select the right pieces without too much difficulty. You can now go to the store or get out a catalog and see clearly which pieces work and which don’t. 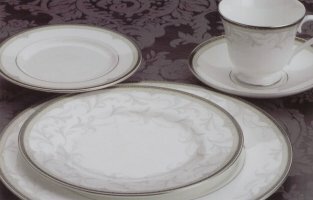 Some good stores online to begin looking at pictures would be www.barronsdinnerware.com and www.silverqueen.com. Make lists and compare them to the definitions you laid down in step one. It shouldn’t be long before you find exactly what you want. Finally, a few carefully chosen accents provide the finishing touch to your creation, and help it blend in with the rest of your house. Whether it is as basic as your table … come on, a square table in a hobbit-hole? The colors of your walls and tablecloth … would you really find neon pink napkins in Lothlorien? Or the decorations you place around the room, every detail placed in your house either adds to or detracts from the look you are trying to create. The dinnerware you so carefully selected set on the appropriate table in your carefully decorated room is simply a tool available to help you turn your 21st century house into a bold declaration of your love for Middle-Earth. This is a work of art. Your work of art; your own masterpiece. A Middle-Earth styled home complete in every detail down to the dinnerware – and it’s not hard to make. Define. Categorize. Accent. Those three basic steps don’t only apply to dinnerware, they work for pretty much every Middle-Earth decorating task. Your dream can come true. Just remember those 1-2-3’s. All you have to do is determine what you want, spend a fun day out shopping and put a little know-how gain via that handy file-folder of articles printed out from Council of Elrond into action. Though, of course, hiring Weta to do it for you could be nice!